with all products manufactured in Cumbria, England. and trying out different brands especially luxury ones. Their jars are a wonderful way to fill your home with fine fragrance. Available in a range fragrances and are a stylish addition to any room in your home. perfect to create a mood for any occasion. a lovely stainless steel lid. and also one that comes in a tin. so there is bound to be something for everyone. "Let the celebration begin with the familiar sound of corks popping, as joy and laughter fill the room. The sparkling accord of green apple, pear and tangy white wine blended with base notes of musk create the perfect celebratory fragrance. Inject some stylish ambience to any room in your home with the simple design of this contemporary small candle jar with silver Wax Lyrical embossed lid. Only the highest quality wax has been used to ensure a clean burn and maximum fragrance throw." sell a range of reed diffusers and home fragrance products. I will be adding some of their candles to my Christmas and new year wish list. 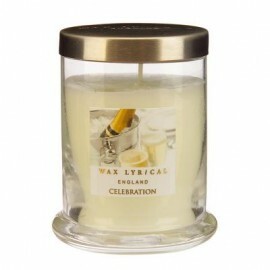 So have you tried Wax Lyrical candles yet?